You are here: Home / Animals / backyard habitats / What is a Naturalist's Garden? I have what is called a naturalist’s garden or a backyard habitat. You can see some photos of my naturalist garden on my Flickr site. It is easy to start a naturalist’s garden. You can take an inventory of your garden and replace plants one at a time, to those that attract native animals. Or you can simply feed the birds from balconies and decks. My backyard habitat makes nature journaling in my own garden convenient and fascinating. I like walking into my garden and seeing butterflies sipping nectar at my flowers and birds eating seeds at the feeders. 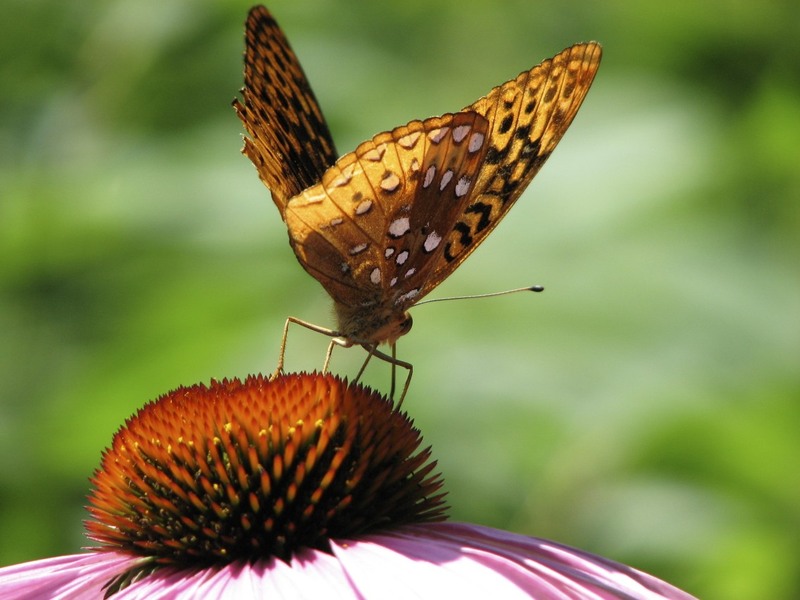 Attracting birds, hummingbirds, butterflies and other animals to your garden is a rewarding pastime. I have learned about the life cycles and natural history of many animals and plants. Sitting camouflaged in my garage, I watch the activity down at the feeders. Right now, over twenty House Sparrows, mostly females, perch on the stems and branches of the thicket at the end of the garden. After eating expensive hulled sunflower seeds, a bird will fly down to the water dish for a sip or two. My feeders have attracted birds to the garden that I didn’t even know were in the neighborhood. Squirrels, Cabbage White butterflies, Monarchs, Eastern Garter Snakes, beetles, bees, etc. are all living and breeding in my little Philadelphia garden. I love going in my garden at midday and watching a giant Monarch butterfly drinking nectar from a Zinnia. I attract butterflies by planting both nectar and host plants. And after many years I have finally been able to attract hummingbirds to my garden. Planting Coral Honeysuckle Vine did the trick. My garden is only about 15 feet wide by 48 feet long, so don’t let size stop you. You can also create a mini-nature preserve where you live. Imagine simply walking outside to sit and observe, butterflies laying eggs, a male House Sparrow feeding a chick or a small snake slithering through the grass. Then writing or drawing about it in your nature journal. If you already feed the birds (and squirrels), adding a few choice plants and features can turn your garden into a wonderful place for animals to live and grow. The following pages will help you along the way. develop your garden into a very well-planned, extensive and beautiful place to study and connect with nature. The National Wildlife Federation also has a Certification Program. This program aims to establish wildlife and native plant friendly places across North America.
. It gives more information on why certain plants attract moths, or bees, etc. And it has great regional plant lists.